The brown and black stripes on Philadelphia's Pride flag are not an attack on anyone, writes Amanda Kerri. Last week in Philadelphia, as part of its month-long Pride celebrations, the city hoisted the rainbow flag on a pole outside City Hall. 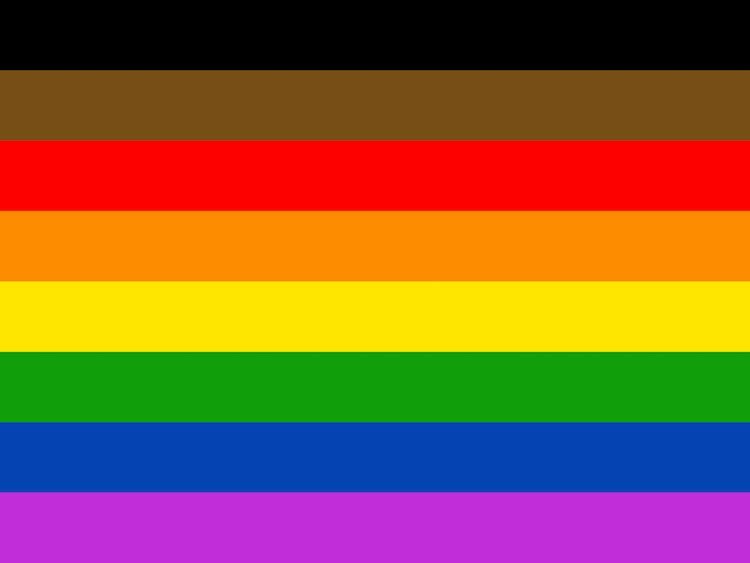 As people clapped and cheered, someone inevitably asked, “Wait, why is there a black and a brown stripe on there?” That person was right to ask why, because, well, black and brown stripes on the Pride rainbow flag are a new thing. Turns out, Amber Hikes, the head of Philadelphia’s Office of LGBT Affairs, approved her committee's decision to add the stripes as a way to give more visibility to LGBT+ people of color. This makes sense when you consider that Philadelphia has had some issues with racial discrimination over the past year. Throw in that there have long been issues of racial division and discrimination in the LGBT+ community nationwide for years, and it’s a good gesture. This person probably said, “OK, cool,” and moved on like everyone should. But of course, a lot of people didn’t. They complained that it breaks with tradition, that there’s no brown in a rainbow, and that it singles out people of color for special treatment. Listen, folks, get over yourselves. The flag is just a symbol of an idea, not an official organization or government, and based on some of the tacky uses for the American flag I’ve seen at Pride before, even that has never bothered you. Also, I can tell you this, if there was an official governing body for LGBT+ people, I certainly would have protested to the Symbols and Signs Committee when it decided to make the Babadook an icon. Really, guys? The Babadook? I can totally relate my search for acceptance to being a monster that kills the family dog (I know it’s a joke, guys … settle down). Many of you may have forgotten that during the ’80s, at the height of the AIDS epidemic, many Pride flags had a black stripe to represent the deaths in the community. Besides, we’ve seen so many variations of the Pride flag over the years, with stars, hearts, triangles, peace symbols, flowers, yada yada yada, what does it matter if we change it up some? If it’s really that important that you get to have your rainbow flag without the dark stripes, then fine, you can stick to the other one. There’s something very telling in the reaction to the new Pride flag as well as the impetus for it. I know that the rainbow flag is supposed to cover everyone in the community — black, white, indigenous, Asian, gay, bi, trans, etc. — but when some people feel they have to do something like this to draw attention to their unique issues, it shows we’ve all failed in some regard. We’ve overlooked something, we haven’t been listening, and we haven’t been supporting each other, and so we aren’t really a rainbow. In fact, instead of putting the stripes on one end of the flag, I would have stuck them right in the middle where everyone can see. Why? Because I see this as not just a way of calling attention, but a way to unsettle those who are a little too out of touch. I agree we should have the a main Pride flag that represents the whole community of sexual and gender variants who are marginalized, and there is really no better symbol than the rainbow since we really are all different types that, when gathered together, bring light to the world. Yet the fact that people felt the need to do this tells me we aren’t really there and that we might in some ways be moving backward, becoming more divided than united. For now, I don’t care if POC want to have their Pride flag variant — it does me no harm and gives them Pride, so why should I really care? The one thing I do care about, though, is that one day we as members of the LGBT+ community are in a place where no one group of people have to do something like this because they feel they aren’t included.